I read Wastelands not too long ago. Though I have heard some people say the beginning is too slow and the first story boring I thought it to be a wonderful collection. The list at the back of the book is simply invaluable to anyone with interest in post-apocalyptic fiction. Read the road when it first came out. Now I love PA lit, but man, that was really heavy. Wonderfully written, but jeez! Talk about 1 nuclear bomb ruining your whole day! 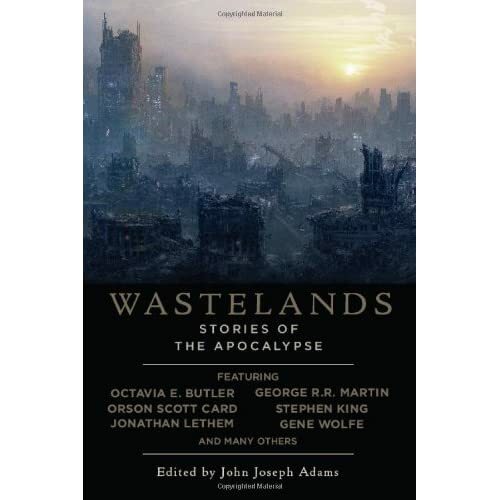 I’ve also read Wastelands (Night Shade Books is run by a guy I used to know). What a wonderful collection of stories! The saddest one was The People of Sand and Slag. (Forgot who the author is). A really great book! Also check out Zombies (also by Night Shade Books). Thanks for the recommendations! I’ll definitely check those out. I’m just about done with The Algebraist right now (not PA, but still awesome). Well there are couple classics you might like. Alas, Babylon by Pat Frank and Earth Abides by George Stewart. Babylon was written in the late fifties and Earth in the late forties so they’re going to feel a bit dated. However they are interesting books. That is, of course, assuming you haven’t read them already. Thanks Jeff, I’ll check those out! Glad to help out. Oh forgot to tell you. Babylon is about World War III and Earth Abides is about a survivor of a plague apocalypse.